When NASA was threatened with losing their budget a couple years ago, a team of former NASA executives saw a light bulb. They decided to supplement their income with a new business venture. For the paltry sum of $1.5 billion, they will take you bang, zoom, to the moon. 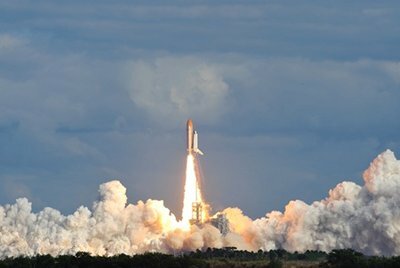 The business venture is called Golden Spike Co., and is made up of a former Apollo flight director, other space shuttle veterans, and former Speaker of the House Newt Gingrich, who at his best, is a little spacey. Think about itâ? ?for a mere 1.5 billion dollars, you can buy yourself and a homey a ride on a spaceship, where you piss into a bag and eat dehydrated food with the texture of Styrofoamâ? ?you donâ? ?t even have to pass a background check! For days, youâ? ?ll soar up into space, and get a view of the planet that only a handful of other people have gotten. And if absolutely none of the millions of things that could go wrong go wrong, youâ? ?ll have a permanent conversation starter for the rest of your life. The last time NASA took a trip to the moon was 40 years ago today. The space race in the 1960s was big news, but once we got there, and didnâ? ?t find gold, oil, or moon people, nobody seemed to care anymore. Even President Barack Obama was over the moon, when he cancelled the return trip. Since then, there have been dozens of privately held space companies that have emerged to pick up where NASA left off. For a number of reasons, itâ? ?s unlikely that any of them will succeed. In the case of Golden Spike, itâ? ?s estimated that the first trip will take place by the end of the decade, and the first launch alone will cost between $7 and $8 billion dollars. If youâ? ?ve got $1.5 billion to piss away on a vacation, why would bother with traditional things? When the Seven Wonders of the World leave you ho-humming, youâ? ?ve got to think bigger. I mean sure, you could do something boring like spend a month in the Maldives, relaxing on the beach. Or test your mettle by climbing Mount Everest. Or head to Rio for a nonstop party. Hell, you could do all three of those things, in style, and still have $1.4 billion dollars to bring clean drinking water to Africa, or pay teachers more. But youâ? ?re probably right. It would be cooler to take a ride on a space ship. Brady Kingsly is a freelance writer living in sunny San Diego, California. You can read more of his work on TWITTER.